The Official Kick-Off to Summer: Grill Season is Here! - Columbia Builders, Inc. The Official Kick-Off to Summer: Grill Season is Here! Memorial Day marks the start of grill season for most homeowners – make sure your station is fully equipped and ready! As Memorial Day approaches, grill masters everywhere, rejoice! Nothing kicks off summer like cooking outdoors for your family…or for a crowd! Most people agree everything tastes better when it’s grilled – from healthy vegetable kabobs to burgers, chicken, and fish. Your options of what to have for dinner increase a bit during the summer, thanks to the ease of grilling. Whether you create quick, delicious meals during the week or entertain family and friends on the weekend, equipping and maintaining your grill station will ensure that you get the most out of it this summer. Here are some great tips for success! When preparing for the season, assemble what you need. Investing in or replacing worn out tools is essential before your first cookout or get together. 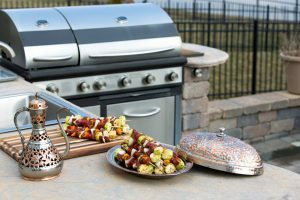 Tongs, a specially designed grill spatula, a meat thermometer, an outdoor garbage can, a fire extinguisher, and fuel – either propane or charcoal – are the basic necessities for any grill station. If you plan on cooking well into the twilight hours this summer, consider installing some nighttime lighting to reduce the risk of over or undercooking your meals. Take care of your grill and it will provide you with delicious food for years to come. Cleaning your grill every time you use it is the key! While preheating your grill, take the time to scrape the grates clean. A compatible grill brush is critical to proper maintenance, so make sure you have the right type. Brass bristles are best for stainless steel grates, while a stainless steel brush is in order for cast iron grates. Wipe up any spills as they happen, and invest in a cover. Covering your grill once it has cooled off protects it from the elements, extending its usable life. Cooking and dining al fresco offers many benefits, including easy cleanup! You’ll have more time to spend with your friends and family if you leave all breakable dinnerware inside, and opt for recyclable paper and plastic products, and serving bowls with lids. Outdoor living that encompasses space for cooking, dining, and relaxing is more popular, with more design choices, than ever before. While building your new custom home with CBI, let us help plan for your outdoor living area, or incorporate a deck or patio into your home’s design! This entry was posted on Friday, May 25th, 2018 at 9:52 am. Both comments and pings are currently closed.